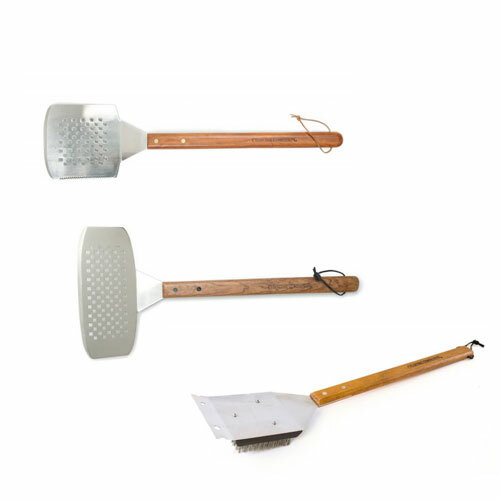 SS Big Head™ BBQ Tools | Patio and Hearth Co. The Big Head™ series of barbecue tools are the perfect solution to lifting larger cuts of meat and fish. Each spatula features a large head and sturdy design to better control big steaks, chops or fish. This monster of a grill brush attacks dirty grill grates with gusto! Our Big Head™ grill brush is a high quality tool that features a stainless steel head with Safe-Scrub™ nylon bristles, rosewood handle, leather hanger and a replaceable brush head. The long length gives you the leverage to put some power behind your scrubbing and scraping, and the brush head is replaceable so you can clean with a fresh set of bristles when needed. Inquire about SS Big Head™ BBQ Tools using the form below.